This was my first class since Easter so we made the changes to our prayer table. Our purple table cloth was replaced by white. Paschal Candle printable from Celebrations in the Catholic Home. They offer it free on their blog. We replaced the thorns with silk flowers and brought back our Alleluia. EWTN DVD: The Divine Mercy Chaplet for Kids. It has a long and short version in both English and Spanish. gave to St. Faustina to share with us of his Divine Mercy. We made our Divine Mercy image found at Catholic Icing. 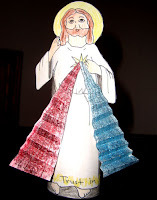 Lacy offers a free printable of Jesus with the radiant rays to color and attach onto a toilet paper tube. I didn't get a picture of the ones we made in class so I'm borrowing one of Lacy's. Making Music Praying Twice. 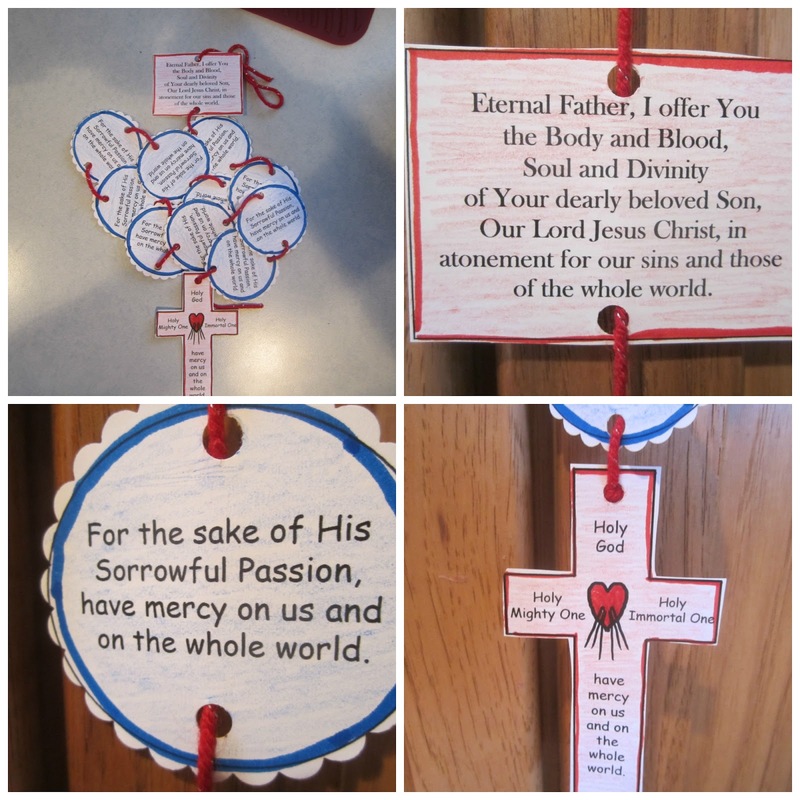 On cardstock, I downloaded her pattern with prayers (scroll down on her page) and then created my own "Eternal Father" prayer to be recited on the Our Father beads. We colored the prayers to make them pop. I also made some Divine Mercy cupcakes. I had seen this idea online to make the inside blue and red. I've done it before for the 4th of July cupcakes and they worked great too for Divine Mercy Sunday. That Resource Site has a great selection of printable resources to celebrate this day. I downloaded the St. Faustina trading card for each of my students. I've linked this post up at Training Happy Hearts and Home to 4 Kiddos. I'm continuously amazed at your creativity, Noreen! You do so many special little things for your class. What a blessing you are to them. Those little touches demonstrate God's love (through you) in so many meaningful ways. I'm sure your kids will remember it for many years. Noreen!!! I had to come and see your Paschal candle and it is beautiful!!! These are wonderful. You are so dedicated. Thank you. You asked about the Altar Gang at THH. I, personally, would NOT use the CD's for a traditional religious ed class. 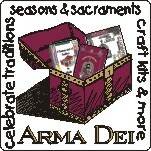 They are fun CD's, with some great messages, but they are long for tradtional religious ed classes and are a but more on the contemporary/modern/imaginative side than the 'meat' side, in my opinion, for class purposes. Sort of Toy Story/Disney-esque in a way but with a faith message... Perfect for supplement and home use, but not necessarily for faith formation classes... I think that the Glory Story CD's are more in line with religious ed in style and content (although even those stories can get long at about 20 minutes, depending on your class.) We also love those here. And, there's the Altar Gang DVD, too, which could be good to get excerpts from. I will let you know once I watch it. Hello Noreen La Fiesta de Enlaces de la Divina Misericordia are available, thanks. Sorry my english. I am continually amazed at your ability to make lessons interesting and enjoyable. 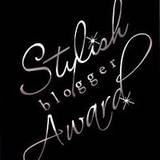 I know you will pass on the credit to the wonderful ladies who share their ideas with you. But all that work and effort is entirely your own. I've been thinking a lot about the Divine Mercy recently. I read St Faustina's diary while I was pregnant with Thomas, and think it's time to read it again. Yesterday I listened to an mp3 talk, and afterwards I realised that the very first Divine Mercy Sunday was also my birthday! 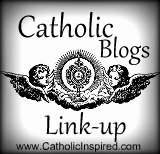 I am a Catholic mom who is enjoying the world of blogging. This blog is to honor God, explore christianity and share my life with you. What I am not, is a writer, expert on Catholicism or Christianity or a web designer. 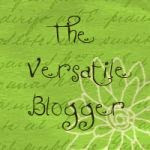 I have absolutely no experience at creating a blog whatsoever! What I do have is a desire to learn my faith and share it with others. 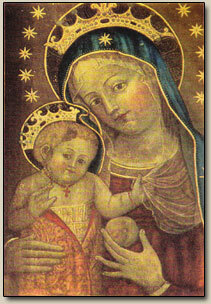 Catholic Inspired ~ Arts, Crafts, and Activities! Protestants: How can you not believe Communion = Body and Blood of Jesus Christ? Thank you Colleen & Stephanie!